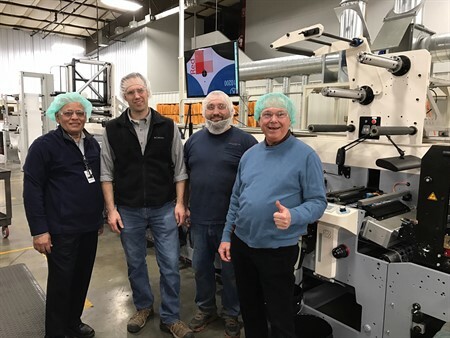 US-based Outlook Group has purchased a new 17-inch, 8-color EF press with automated print pressure settings from printing and converting machines firm MPS Systems to boost its operations. Outlook Group is engaged in printing pressure sensitive labels, flexible packaging and folding cartons. The new machine will complement Outlook Group’s existing MPS EF flexo press which was purchased and installed less than two years ago. MPS Systems North America vice-president Per Kees Nijenhuis: “We are very proud to share that our partnership with Outlook has been a real success and that the EF platform has helped Outlook Group to continue their growth. “The EF platform has proven to be a very successful platform in the North American market as it is a real future proof press platform, helping our customers to grow in today’s increasingly dynamic and competitive markets. Outlook Group, which announced its merger with M&Q Packaging under M&Q Holdings in 2016, has invested in the second MPS press as part of its growth strategy. Peters said that the EF machine is designed to print extremely thin films while holding a very tight register, along with its operator interface and ease of use. Outlook Group provides packaging solutions including labels, shrink sleeves, folding cartons, flexible packaging, fulfillment, and contract packaging solutions. It serves customers in the food and beverage, private label, personal care, consumer healthcare packaging, consumer products, and contract packaging markets. Image: Officials from MPS and Outlook Group. Photo: courtesy of MPS.